The boundary between the western and central time zones established is a line running north between Java and Bali through the center of Kalimantan. The border between central and eastern time zones runs north from the eastern tip of Timor to the eastern tip of Sulawesi. Daylight saving time is not currently observed in almost all of Indonesia due to its tropical location, resulting in those areas using their respective time zone all year long. Northern Sumatra Time (NST) (UTC+06:30), was observed in Aceh, Padang and Medan. Central and Southern Sumatra Time (CSST) (UTC+07:00), was observed in Bengkulu, Palembang and Lampung. Java, Bali, and Borneo Time (JBBT) (UTC+07:30), was observed in Java (Jawa), Bali, Madura and Kalimantan. Celebes Time (CBT) (UTC+08:00), was observed in Sulawesi and Lesser Sunda Islands. Moluccan Time (MCT) (UTC+08:30), was observed in Ternate, Namlea, Ambon and Banda. West Irian Time (WIT) (UTC+09:00) was observed in West Irian. It observed during 1 November 1932 to 31 August 1944. Dutch New Guinea Time (DGT) (UTC+09:30), was observed in West Irian during named Dutch New Guinea because Netherlands still hold West Irian. It observed from 1 September 1944 to 31 December 1963. Daylight saving time was observed in Jakarta  from 1 May 1948 to 1 May 1950. It's UTC offset during daylight saving time is UTC+08:00. It observed from 1 November 1932 to 22 March 1942, and from 23 September 1945 to 31 December 1963, except West Irian, ever observed it until 1944 and Jakarta, ever observed it all, except from 1 May 1948 to 1 May 1950. From 23 March 1942 to 22 September 1945, All region in Indonesia, except West Irian used Japan Standard Time (JST) (UTC+09:00) for the sake of the effectiveness of Japanese military operations in Indonesia This makes the western parts of Indonesia on double daylight saving time and central parts of Indonesia on daylight saving time. 2012-05-26 The Jakarta Post reported on 26 May 2012 that a single time zone using UTC+08:00 may start on 28 October 2012. 2012-08-31 Jakarta Globe reported on 31 August 2012 that a single time zone is now put on hold. The Indonesian Economic Development Committee (KP3EI) cited that they will need at least 3 months to communicate and plan for the change. Hence this could happen in 2013. The IANA time zone database contains four zones for Indonesia in the file zone.tab. ^ Soeharto (26 November 1987). "Keputusan Presiden No. 41 Tahun 1987" (PDF). Keputusan Presiden No. 41 tahun 1987 - BAPPENAS. BAPPENAS. Archived from the original (PDF) on 20 April 2016. Retrieved 9 April 2016. ^ VIVA.co.id, PT. VIVA MEDIA BARU -. "Indonesia Pernah Ubah 9 Kali Zona Waktu". bisnis.news.viva.co.id. Retrieved 9 April 2016. 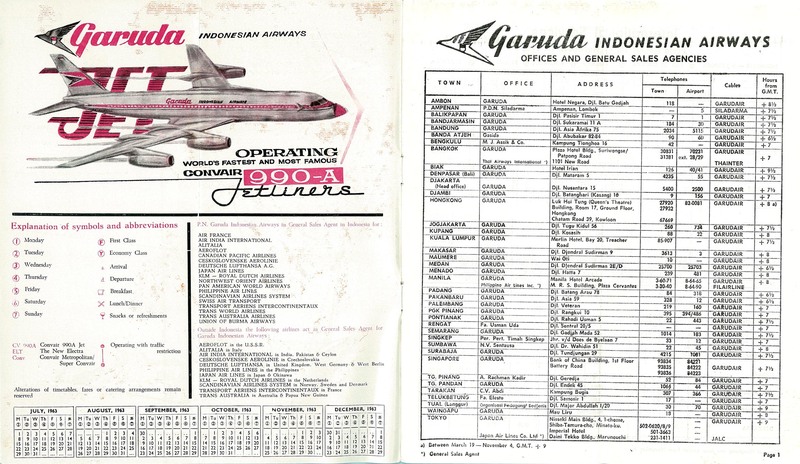 ^ "Garuda Indonesian Airways". timetableimages.com. 1963. Retrieved 4 March 2019. ^ a b "Time Zone in Jayapura, Papua, Indonesia". www.timeanddate.com. Retrieved 9 April 2016. ^ a b "Time Zone & Clock Changes in Jakarta, Jakarta Special Capital Region, Indonesia". www.timeanddate.com. Retrieved 30 March 2018. ^ Post, The Jakarta. "Single time zone may begin in late October". thejakartapost.com. Retrieved 30 March 2018. ^ "Indonesia to implement single time zone". khabarsoutheastasia.com. Archived from the original on 31 July 2012. Retrieved 30 March 2018. ^ Okezone. "Hatta : Penyatuan Zona Waktu Tidak Batal : Okezone Economy". okezone.com. Retrieved 30 March 2018. This page was last edited on 13 April 2019, at 21:35 (UTC).